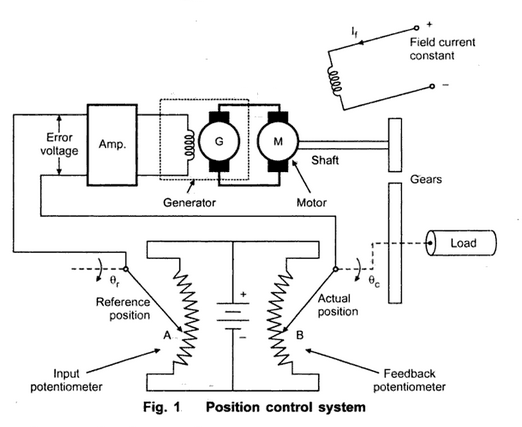 Definition : It is feedback control system in which the controlled variable or the output is a mechanical position or its time derivatives such as velocity or acceleration. A simple example of servomechanism is a position control system. Consider a load which requires a constant position in its application. The position is sensed and converted to voltage using feedback potentiometer. It is compared with input potentiometer voltage to generate error signal. This is amplified and given to the controller. The controller in turn controls the voltage given to motor, due to which it changes its position. The scheme is shown in the Fig.1. 1) Power steering apparatus for an automobile. 4) Roll stabilization of ships.